Sonic the Hedgehog 4: Episode I is a sequel 16 years in the making. Pitched as the direct descendant of 1994's Sonic the Hedgehog 3, Sega's taking the series back to a simpler time. Does Sonic 4 deliver? Sonic The Hedgehog 4 is a simple, straightforward 2D side-scrolling platformer, the kind Sega and Sonic Team used to make. In classic Sonic fashion, the hedgehog with attitude collects rings and battles the evil Dr. Eggman. Stages will be familiar to seasoned Sonic fans, but the game has a few twists in addition to its new coat of hi-def paint. Grown-ups whose parents bought them a Sega Genesis (Mega Drive) instead of a Super Nintendo. Anyone who favored a blue hedgehog over a plumber. Those who want a Sonic game without swords, guns or sports cars. This is the Sonic the Hedgehog game fans have been begging for: no 3D gameplay, no new animal friends and no bizarre hedgehog-human romance. It's all blue skies from here! Or is it? Is Sonic 4 truly a worthy sequel? 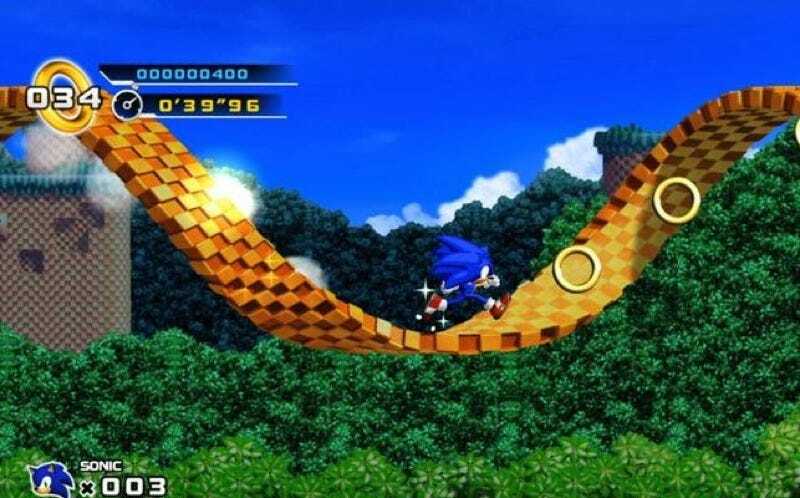 Parts of Sonic 4 are homage to the earlier titles. Stages and even many boss battles have a familiar been-there, done-that vibe. For example, "Splash Hill Zone" is actually a HD rework of Sonic the Hedgehog's "Green Hill Zone". Likewise, the other zones are tweaked versions from Sonic to Sonic 3. Sonic 4 doesn't wipe the slate clean. Then again, it doesn't have to. The difficulty curve for the final Dr. Eggman fight is rather steep. So how is Sonic 4 different from previous classic Sonic games? Early Sonic games were primarily about speed. Sonic 4 adds to that with elements like puzzle solving. In the Lost Labyrinth Zone, for example, Sonic carries around a torch, illuminating rooms and igniting dynamite. It's not exactly "classic Sonic", but it does mix up the action. One gripe is that Sonic feels much more "floaty" at slower speeds than he did in the Genesis era. This can can make the game's slower platforming sequences tougher than they should be. However, once he gets running, this isn't an issue. Do the new elements work? The puzzle solving is well done, but the most welcome addition is the homing spin attack. When enemies or springs are close enough, a red target appears. By pressing "jump", Sonic locks on and spin-attacks towards the target. This mechanic—seen in a few Sonic the Hedgehog games that play in three dimensions—opens up platforming, making it possible to spin attack a number of enemies to traverse an area. There isn't a hand-holding tutorial that introduces this mechanic, either. It's there be discovered naturally during play. But what about the Sonic Cycle? This game certainly aims to please. Maybe too hard. At times, it seems like Sega (and developer Dimps) read every complaint and every forum post ragging on Sonic and delivered a title to negate that criticism. The game does have a design-by-committee, give-them-what-they-want feel to it. The goal is simple, but noble: provide a satisfying Sonic experience. This isn't the brand new Sonic 4 sequel you have been waiting over 16 years for. The game feels like a remastered greatest hits collection. You've heard the tunes, you remember the words, and you find yourself singing along. It's a competent, current gen revisiting of Genesis-era Sonic. But dubbing this game "Sonic The Hedgehog 4" seems like a bill of false goods. When I played Sonic 2, I didn't want a rehashed version of Sonic 1. Ditto for Sonic 3. Sega stuck too closely to layout and design of those original three games and not close enough to the spirit of them. Sonic 4? More like Sonic 3.5 in HD. Sonic the Hedgehog 4: Episode I was developed by Dimps and Sonic Team and published by SEGA for the Xbox 360, PlayStation 3, WiiWare and iOS. The HD home console version was released on October 13. Retails for 1200 MS Points or USD $14.99. A copy of the game was given to us by the publisher for reviewing purposes. Played through all zones and defeated Doctor Eggman.